As I've mentioned before, International Babywearing Week 2009 (IBW) ended a few weeks ago. Unfortunately it was the same week as Hari Raya, which meant that most Malaysian Babywearers were too busy with the Raya festivities to really celebrate IBW. That's not to say we're not celebrating though ;) Just that our celebrations are a little bit delayed. 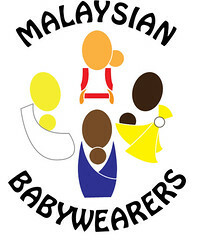 In conjunction with IBW, Malaysian Babywearers have launched a few online contests for all Malaysians to enter. There are so many prizes to be won, and all you have to do is send a picture (or two, or ten!) or a caption or a slogan, and you can get these awesome prizes that include slings, gift vouchers and DVDs. So go on ahead to http://malaysianbabywearers.blogspot.com/search/label/IBW09%20contests for more info. Good luck, glam mamas!